Belgium equals beer. And you want to discover this intriguing cultural facet of ours. I understand. But one good piece of advice: do not go to a tourist-trap beer shop in the city center. They’ll sell you ‘exclusive’ ‘Belgian’ beers, brewed by a big multinational corporation, for thrice the price we pay at the supermarket down the street, and which we only ever buy when we’re really uninspired. Try Malting Pot instead. The owner, Sam, studied archaeology. He wrote his thesis on the social function of beer in Mesopotamia 5000 years ago. After theory came practice: he opened his own quality beer shop in 2012. Malting Pot‘s varying selection consists of up to 200 different craft beers brewed by small, traditional breweries. Most of the beers come from Brussels, Flanders and Wallonia, but Denmark, Italy, the UK, Germany, New Zealand and the US are represented as well. 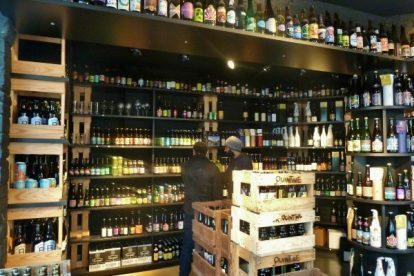 The owner knows his trade and will be happy to help you choose the beer you didn’t know you needed. Start your day with a Breakfast, celebrate Jesus’ resurrection with a Paasbier, swallow down a Bitter sweet symphony, be naughty and drink a Stouterik, surprise your mother with a Big mama, lock yourself up with a Dark penance, try not to drop the Molotov Cocktail or scrutinize the skies while having a Nostradamus. Malting Pot is too far away? Try the very similar Malt Attacks in Sint-Gillis instead.